Fitness is all about progress. No matter what you’re tracking—whether it be weight, distance, time, or calories—stopwatches are great piece of equipment to have if you’re working towards a specific goal. But with so many options to choose from, it’s sometimes hard to know where to start. This review is meant to help you find the best stopwatch for your particular use case. We’ll show you the different types of stopwatches to lookout for, important things to consider before buying, and review 5 of our favorite styles. Top-of-the-line stopwatch with all the bells and whistles. Data can be uploaded and printed on the spot. If you need something for frequent use and serious training, this is your best bet. Comes with a 46” lanyard making it perfect if you coach or train. Lightweight, easy-to-grip, and beeps when you press the buttons so you know it’s working. All the bells and whistles at an affordable price. Perfect if you coach and need to track split times or lap times. Lightweight and resilient in case you drop it. Traditional mechanical watch for basic timing functions. If you are old school and want something simple, easy-to-use, and built to last, this is a great choice. Small and compact timer/watch that doubles as a compass. Great for clipping on to your belt loop for easy access on the job. Dual-split recallable memory that can 2000 laps (hence the name). Water resistant with a 5-year warranty. The large display makes it easy to read and the big buttons make it easy to use. Comes with alarm and displays date and time. Slight snap and beep when you press the buttons. Water resistant and comes with a 5-year warranty. The long hand is 30-seconds and the shorthand is 15-minutes. Timer moves in 1/10 increments and comes in a heavy-duty steel case. Resilient design that can take a beating. Backlit display makes it easy to read at all hours of the night. The 3-row display makes the numbers a bit small and hard to read. The display is missing a backlight so it’s hard to read in the evenings. Difficult to read at night since display is not backlit. No split time tracking. The plastic cover may not hold up if you drop it (lanyard recommended). Built-in compass is unreliable. No split time tracking. There are a lot of competitive stopwatches out there. Depending on your needs and your budget, the options vary. Let’s take a look at some different categories of stopwatches, who they’re for, and learn about their specifications. If you’re a first-time user and new to timing yourself, a basic function stopwatch will usually have everything you need. If you’re looking for something a bit more advanced that’s able to track multiple events, you’re better off going with a multifunction stopwatch. Multifunction stopwatches are more advanced timers and fit to handle multiple events. You can track things like lap memory, intervals, and multi-line displays. 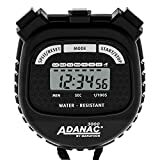 Multifunction stopwatches may even have recall capability (memory and storage) which is great is you’re looking to monitor your progress over time across multiple days, weeks, or months. The more functionality you have with your stopwatch, the more you can expect to pay. Some stopwatches come with the actual printer whereas others are compatible with just about any printer type that must be purchased separately. Mechanical stopwatches come with the sweeping hand and are often referred to as “old school” timers. The biggest drawback with these types of stopwatches is that they’re not as accurate as digital watches and are often harder to read. If you want something nostalgic, inexpensive, and for basic usage, mechanical stopwatches will do the trick. Otherwise, if you need anything more than just the basics, you’re better off going with a multifunctional watch or printable stopwatch. Here are the types of things you want to be thinking about as you narrow down your search for the best stopwatch. What type of sport or activity will you be using for your stopwatch? This is the most important question to ask yourself because the features you’ll need will totally depend on what you’re using your watch for. If you’re timing any water sport or you’re somebody who sweats a lot, water resistance is a must-have feature. The last thing you want to do is miss a personal best because your timer got splashed or sweat on. This feature is most important for swimmers and track runners. Stopwatches with this feature automatically calculate strokes and strides—programmed for every 3rd stroke/stride. A cumulative split means that your overall time measurement will continue while you’re recording laps or split times. This is helpful when you want to make a note of each time a lap is completed and keep track of overall time. Some watches even have a triple screen showing past lap, current lap, and overall time. Countdowns are specifically helpful in fitness related activities. A lot of workouts require proper set-up with equipment, so having a delay is useful. Data can be uploaded and printed on the spot. It comes with a 5-year warranty which is higher than the majority of timers and speaks to its durability. The only major drawback is the triple line display makes the numbers smaller and a bit harder to read than a single line display stopwatch would be. If you’re a serious athlete looking for a top-of-the-line product to help you push yourself to the next level, the Ultrak 499 2000 is a great choice. This multifunction stopwatch is the best bang for your buck. At a modest price, the Ultrak 100 offers 3-row display, lap splits, and ergonomically designed button placement. It also comes with calendar, alarm, time, and stroke frequency features. The biggest drawback is that it’s not backlit which means it can be a bit difficult to read in the evenings. Some of the buttons also require a bit more pressure from your fingers than other timers so you have to make sure you’re pressing it right in the sweet spot. If you want a stopwatch that can handle most of your training needs and intend on using it primarily in the daytime, the Ultrak 100 Lap is a great choice. If you’re a serious athlete and want to use your timer at all times of the day, you’re better off going with the Ultrak 499 2000. This basic feature stopwatch has a solid, water-resistant shell and an extra large display. The Marathon displays date, time, and even tracks split events. Laser tuning marks time to the 1/100th second, and the large buttons create start/stop ease. The biggest drawbacks of the Marathon Adanac 3000 are the fact you can’t turn off the hourly chime which can get annoying. It also doesn’t have a countdown feature or any memory which means you’ll have to write down split time as they happen. 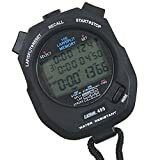 This stopwatch is perfect for phys-ed teachers and coaches, but it might not have enough features to compliment more professional atmospheres. Step back in time to your 1970s gym class. There’s your coach—cinched gray sweatpants, bushy mustache, smelling like cigarettes—barking at you to run faster. Remember that mechanical stopwatch he had in his hand? Well, they still make ‘em. The Ultrack Mechanical’s turns are 30 seconds with a 15 min shorthand. It also has a smooth yet rugged steel case which will prevent the timer from being compromised if you happen to drop it. The Dakota Digi Clip has a sturdy carabiner molded to the stopwatch. The steel, spring clip conveniently connects to your belt loop or backpack which makes it nearly impossible to lose and easily portable. It comes with a backlit display which makes it great for training in the evenings. It also doubles as a compass which makes this timer great for training and hiking. The biggest drawback is the fact it has no memory which means you can’t monitor your progress over time. You also can’t split times which means you can’t do lap tracking or anything of the sort. If you’re looking for a mid-tier, multifunctional stopwatch, for basic to intermediate training, the Dakota Digi Clip is a great choice. If you’re a serious athlete looking to really push yourself and track your progress over time, you’re better off going with a higher-tier model like the Ultrak 499 2000. Q: Are there other options besides a stopwatch? A: Of course. Again, this all depends on the style of events you’re timing. Say you’re timing a horse race where several competitors could be crossing the finish line simultaneously—it’d probably be best to upgrade. To increase the precision of timing, you could use wireless laser timers. They take the guesswork out of accuracy and human-error. The only downside is they’re pretty pricey. A remote control digital timer is another option. These would be best for gyms or events where participants want to be aware of the time elapsed. The LED screens are large, and they’re capable of countdowns and interval timing. Q: How precise are stopwatches? A: Let’s start with the basics. This term precision is often misunderstood. Precision means reliable and repeatable measurement. Old fashioned analog stopwatches only have so much finesse availability (a resolution of 1/10 of a second) Digital stopwatches have a resolution of 1/100 of a second. But you have to take into account the response time and human error. Human precision can only measure roughly 1/10 no matter the device. So while digital stopwatches have precision, accuracy is dependent on the user! Stopwatches are handy devices to time races, relays, and other sporting events, and can help you take your training to the next level. But don’t forget that they’re only as precise as the user! If you’re looking for a top-of-the-line stopwatch that has all of the functionality and the warranty to back it up, we recommend the Ultrak 499 2000. If you want a stopwatch for occasional usage that’s easy on the wallet, we recommend the Ultrak 100 Lap. We hope this review has helped you narrow down your search. If you have any questions or want to make a suggestion for this list, please let us know in the comments below! We usually respond within 24-hours.